Another great book by this writer! Mae Clair has created a good plot and has developed her characters far enough to make you care about what happens to them. 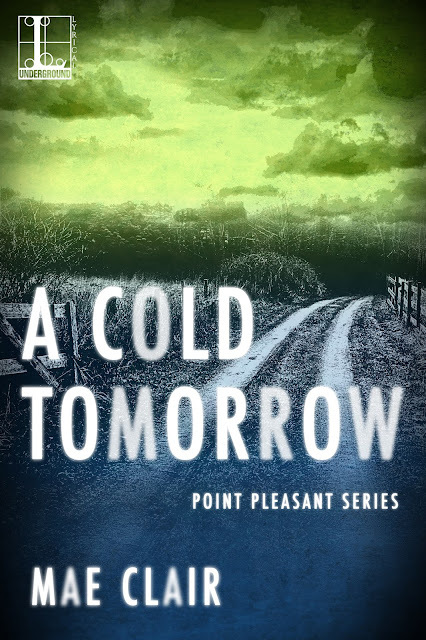 A Cold Tomorrow is a suspenseful story, filled with interesting if not quirky supporting characters.The small town ambience, Point Pleasant, appeals to me. The story is fast-paced and well thought out, and the author does a good job conveying the conflict in both Kate and Ryan , and bringing them together in a satisfying resolution. Or not? A Cold Tomorrow definitely doesn't let you down when it comes to adventure , legend and unexplained phenomena with a dash of romance. You feel like you just can't get enough of the story and the people in it. The characters are compelling and memorable. The Mothman is one of the characters that moved me and strengthened my opinion that he isn’t what many of the Point Pleasent people think him to be. The title is, in my opinion, symbolic. COLD has hidden meanings that are revealed to readers along the story. We meet characters from book `1, A Thousand Yesteryears. And it’s logical as the story takes the action from where it ended in book 1. The author does a great job reminding us, here and there, about main events in the previous book, thus making it easy for the reader to reconnect with the characters. The focus is this time on Katie Lynch. Mother-daughter and mother-son relationships are highlighted with finesse. As well as the brother-brother one, I mean Caden and Ryan. You can't help but love Katie’s strong but sensitive personality. Caden’s deep, gentle humaneness is inspiring. I enjoyed the closeness of the characters in the story. I wish real life could be as this story portrayed. I won't bother with a synopsis as I hate spoilers. But I will say I really enjoyed A Cold Tomorrow. It captured my attention from the opening pages and held my interest until the final sentence. The author struck an excellent balance of adrenaline rushed action and adventure with warm, sentimental moments. A very enjoyable read. Mae Clair’s novels are must reads for me, so I was thrilled when I could read the new book, A Cold Tomorrow. To say more would give too much away. There is romance, but nothing that can remotely be called steamy. The ending was a stunner. Fans of paranormal/supernatural/mystery/ Men in Black and UFOs won't want to miss this exciting story of old lore and modern day mayhem. I received an ARC free copy of the book in exchange for an honest review. I loved this one too. She did a great job. Indeed, I agree with you. It's even better than book one. You grow with each book and A Cold Tomorrow shows it thoroughly. And as a strong believer in UFOs, men in black and other strange things in our world that can't get a satisfying explanation from authorities, your story was a real treat for me. Best of luck with your writing! Get well soon!